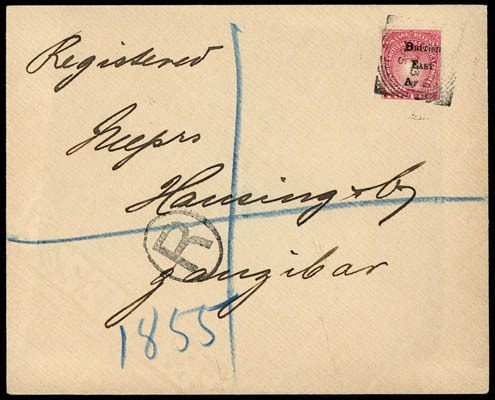 British East Africa, 1866-1913 East Africa Incoming Mail, collection of 33 covers and 37 cards mostly on exhibit pages; starting with rare U.S. 1866 three color franking cover to Zanzibar (reduced with most of 30¢ absent), other covers include 1883 & 1892 usages from India to Zanzibar, 1899 Egypt to Zanzibar, 1899 Lourenco Marques 4-color franking to Dar-es-Salaam, similar Riga, Russia registered usage in 1900, 1892 Bavaria mis-direct usage to Tanga sent to Tanger, Morocco, 1901 Madagascar Consulate cover to Tanga, 1904 Moncay, Indo-China to Zanzibar forwarded to Corsica, two covers from Mayoette in 1910 to Zanzibar, etc., generally F.-V.F. 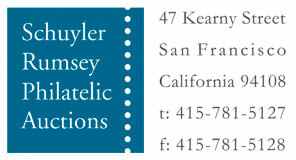 or better. 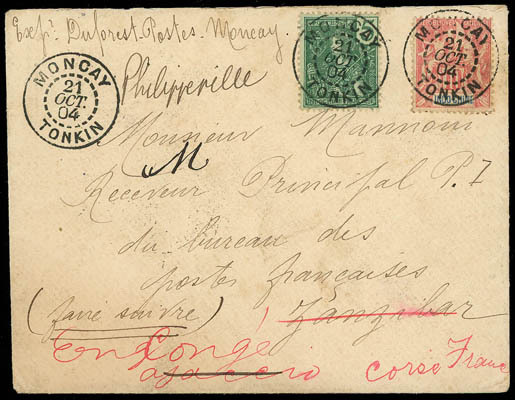 British East Africa, 1890-95 Fournier Forgeries, small group of 4 items produced by the infamous forger, François Fournier, includes two items with forged impressions of the 1890 Overprints and two items of the 1890-95 Issue, the 2r block of 6 and the 5r strip of 3, Very Fine. 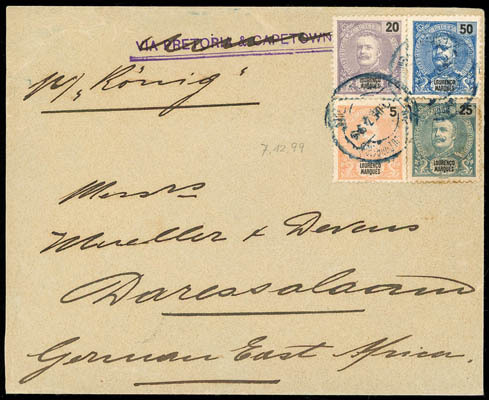 British East Africa, 1890, Arms of the Company, 2a Vermilion, tied on large size 2a Registered Postal Stationery envelope to the German Consulate in Zanzibar by two strikes of Lamu, Oc 22, '92 squared circle postmarks, backstamped with Mombasa transit & Zanzibar arrival postmarks, Very Fine and rare, This Registered Letter Envelope, Minns RE2, is only recorded used between 15 July 1892 and October 1893. Scott No. 16+18 Estimate $4,000 - 6,000. British East Africa, 1895, "British East Africa" on 8a Blue, 1895, "British East Africa" on 1r Rose, each on separate 1895 philatelic covers from Mombasa to Zanzibar, Very Fine and attractive. SG No. 42. Scott No. 47 Estimate $300 - 400.